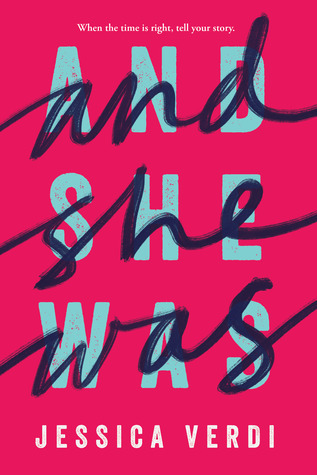 Harbor School’s Book Club is delighted to be reading just published And She Was by Jessica Verdi. This year, Harbor School Library was the recipient of Lambda Literary’s Writers in Schools Grant. We look forward to welcoming Jessica Verdi later this month! Students are really getting into the book. Below find a few questions that came from our latest discussion. A note: We all agree in book club that we mean well and that we sometimes mess up talking about issues that are not our own. We seek and accept gentle reminders on proper nomenclature and work hard to develop an inclusive, trans-positive vocabulary, even if we know we will sometimes get it wrong! Catalyst: What propels the action of this novel? What is Dara’s definition of success? What is the/your definition of success? What is the interest that would give you the kind of drive that Dara has for her sport? There is a lot of talk about being “selfish” and also being authentic to one’s self. How does Mellie live her truth? Is Dara justified in questioning her mother’s choices? How would you react to a secret your parent/s has/have kept from you? We are reading the most compelling piece of nonfiction for book club this month. This one hits on gender, race, class, and the volatility of the adolescent mind. It is a stark look into the criminal justice system and will force every reader to look some bias or another right in the face and deal with it. Our latest book club choice is Robin Benway’s Far From the Tree. We have had about 14 people involved in the book club, and again huge thanks go out to Chelsea Riela, our MyLibraryNYC liaison librarian who makes it possible for us to get a bunch of the books at once! 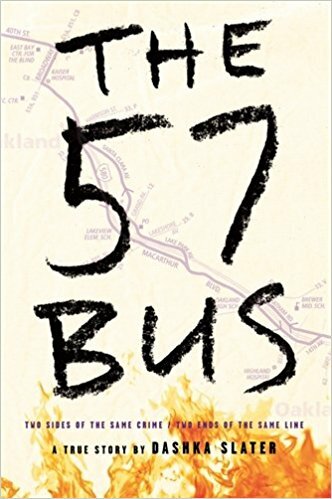 This book, which we chose BEFORE it won the National Book Award for young people (nice work, Chelsea! ), has allowed students and teachers to talk about family in a whole new way. Students consistently share so much about their lives when talking about this book. It is amazing. Grace, the protagonist and catalyst of the plot, finds herself pregnant and gives her child, Peach, up for adoption at the very start of the book. Being adopted herself, Grace’s need to be tethered compels her to search out her birth mother. Instead, she finds out that she has two half siblings at a stone’s throw, and the three meet. Grace, an only child, finds out how complicated it can be to have a larger family. She does not share the impetus for her wanting to meet them and their comments about what kind of a birth mother gives up her kids hit close to home. Further, Grace and Maya are white, and were adopted as tiny babies, while their brother Joaquin is half Mexican and at 17 years old is still in the foster care system. Maya, who has a sister and an alcoholic mother (and a checked out father) is struggling with commitment to her girlfriend. Joaquin is struggling with the loss of his ex-girlfriend and how to be a family member. Each sibling has his secrets. This book finds a way to hit close to home for most readers and is a great book club book. 1. Kids! My students are being especially kind and loving today. 2. Books! We got the CCD grant renewal and the order for more maritime titles went in last night. Also, lending limits have been relaxed so students have more books on hand over the break to read. 3. A Holiday right around the corner! The Holiday shall remain nameless. Suffice it to say the good people of Harbor School will enjoy 10 days in a row without school. 7. Student interns are cleaning up the library for the break. My desk is looking better than ever. They rock my world. 8. Cool English Projects. Students are recording their re-worded Holiday Carols for English class. I’m not even sure what the assignment was but they are having a blast. Last week, we finished our fall Black Lives Matter book club. The book club met on a series of Wednesdays during lunch periods. We hosted 16 book club members and was made possible by our partnership with NYPL through MyLibraryNYC (which makes it possible for us to borrow multiple copies of a single title. Amazing!) Students delved into the (ever) timely and pertinent topic of police brutality as we together explored the shooting death of an unarmed young man named Tariq Johnson. Tariq had gone out to the corner store to get milk for his mother and when he forgot his change, the owner, who had known Tariq his whole life, stepped out to tell him he forgot his change. A white man who was walking by thought the bodega owner was yelling after Tariq for shoplifting (uncovering his racist paradigm) and Tariq is killed by another white man, who was driving by. Told from varying perspectives, everyone from the bodega owner to Tariq’s best friend, from the local hair salon stylist (who had been Tariq’s babysitter) to a national politician trying to turn the incident into a political win for himself. The voices are hauntingly, painfully, tragically real and made it possible for Harbor students to participate in the #BLM national conversation. 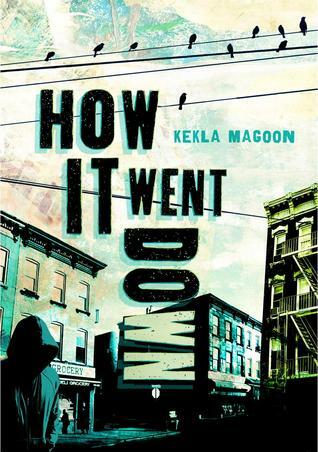 We reached out to Kekla Magoon to see if she could come for an author visit, but she is busy working on something new – looking forward to seeing what it is! We loved this book and the important conversation that it sparked in our student body. Who’s that reading at the Library? Plenty to read in the library! These two came by to do a little light reading today. We have tons of new books and magazines in! Come by and take out a book for #IndependentReadingWednesdays ! Let’s see if you can identify these costumed readers! Kara Thomas Comes to Harbor! 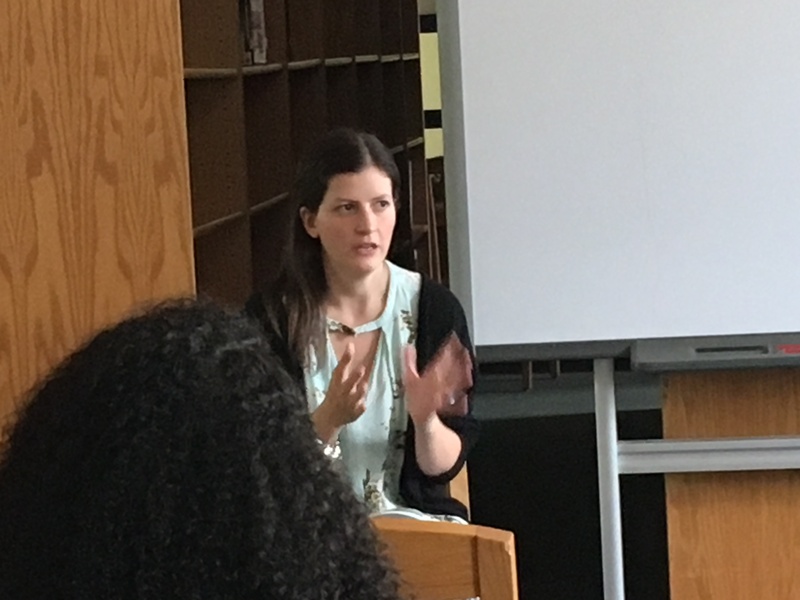 Harbor School hosted author Kara Thomas, who wrote The Darkest Corners and is about to release Little Monsters. Seniors, who had read The Darkest Corners in their AP English class, gathered to meet Kara, talk about the book, and explore the elements of a mystery. Kara shared her process, and talked about the book itself. The AP class discussed the question of how a child’s lies could impact a family’s life in the aftermath of a horrific crime, but more importantly, how a young person’s testimony can land a man in prison. Follow Harbor Library on Twitter!